I ended up going 3-0 last night, which was a good feeling this early in the season. Almost every team is in action tonight in the NBA and I have another three picks that I’d like to share with readers. Houston moved to 5-0 on the season with a win last night over the Heat (108-91). The Cavaliers were dominated in Portland (101-82) and the Lakers were unable to find their first win of the season. You can bet on every NBA game at Bovada this season. New players will earn a 50% free bet bonus for up to $250 on opening deposits. No code is required, simply deposit and receive your cash. 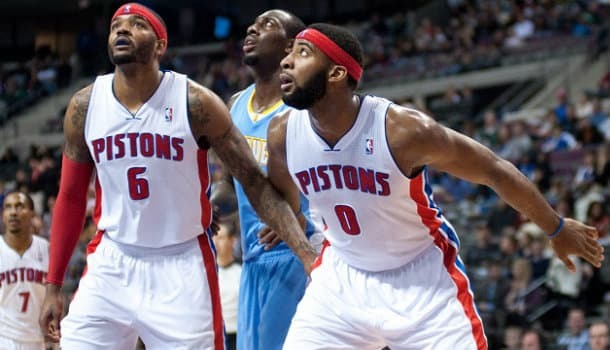 The Detroit Pistons (0-3) have gotten off to a terrible start this season. The Knicks (2-2) should get a lot of the public action to cover the point spread, but the NYK tend to struggle in Detroit. Detroit has won the last two home games they’ve played against the Knicks and oddly enough Detroit was favored by 4 points in both games. Let me explain why I expect Detroit to cover ATS. First, off the Pistons will have a huge edge in the paint. Smith and Drummond should be able to have no problem manhandling Acy and Dalembert. Really, the Pistons only have to shutdown Carmelo. If Anthony is unable to explode offensively the Knicks won’t be able to keep up. The Knicks are only averaging 90.3 PPG (27th), but the Pistons have been even worse thus far (86.7 PPG – 30th). One part of me is saying that this line feels like a complete trap, but I’ll bite. Sacramento (3-1) is off to a hot start because of strong defense (96.5 PPG – 9th) and rebounding (48.8 RPG – 2nd). DeMarcus Cousins is a beast that’s averaging 22.5 PPG and 10.5 RPG, but Rudy Gay is leading the team in scoring (23.3 PPG). This Kings team is loaded with talent and should crush the Nuggets. Denver (1-2) has lost two in a row including their last game, which was against the Kings (110-105). The loss came at home and now they have to play in Sacramento, which will be even tougher. Faried and Mozgov have been strong on the glass and the Nuggets average 44.7 RPG (5th). On paper these two teams are similar, but the Kings have the better talent and at –2.5 I can’t pass them up. Toronto (3-1) just dominated OKC as I thought they would and they were even able to sit the starters for a large portion of the 4th quarter. However, now the Raptors head on the road for a B2B game. This early in the season these B2B games are tough, especially when you have to travel. Boston (1-2) was off last night. The Celtics have now lost two in a row and Rajon Rondo has been ineffective. Boston is scoring 108.0 PPG (3rd) and allowing 109.0 PPG (29th). Toronto has averaged 106.3 PPG (5th) and has allowed 101.3 PPG (21st), which is why most bettors will be on the over in this game. However, three of the last four H2H games have gone under the total. If you look at the last four H2H games played in Boston none of the games have had over 200 points either. I wouldn’t be surprised if the Raptors came out flat in this game early on and never quite get their footing in this B2B situation. With such a high total I have no problem backing the under.